Posted on December 12, 2013 by David H.
The eastern gray squirrel (Sciurus carolinensis) is ubiquitous in Philadelphia today, and in many other cities as well. However, this was not always the case. Posted on October 30, 2013 by David H.
If you take a turn onto East Hermit Lane, just off of Henry Avenue after Henry Ave has crossed over going west from East Falls, and go down towards the site of the Kelpius cave, you’ll see on your left, on the east side of East Hermit Lane, a large stand of white pines. Some of them are quite large, over two feet across, and with a canopy dozens of feet above the ground, they tower above the house that’s there. Underneath them there is a ground layer with pokeweed, and jumpseed, and enchanter’s nightshade, and many other herbaceous plants, and there are also beeches and birches coming up in the understory. But the white pines dominate, in terms of the aspect of the stand, and in terms of sheer numbers and size. This stand is strikingly similar to one along Cresheim Creek, and based on their size, they (the ones along Hermit Lane, that is) were quite likely planted at a similar time as were the ones along Cresheim, and as is clear from the picture below, the Hermit Lane pines were there in 1931 which provides further evidence as to their age, and solidly provides an upper bound (of 1931) to their date of planting. These trees along East Hermit Lane, however, while some of them are on a slope, most of them are not, and the plantings on the level grade are much denser in the above picture than the ones on the percent grade (this difference is also noticeable when you walk among them today), and so, different from the white pines of Cresheim Creek, the Hermit Lane pines probably weren’t planted for erosion control, but perhaps more broadly as part of reforestation efforts of a century ago, to bring back the sylva to Pennsylvania. If we look at a map from 1895, we see that this locale (where the white pines are) was privately owned at that time, and though, as we see from a map of 1910, the neighboring lots were part of Fairmount Park by the earliest parts of the 20th century, this particular site (again, where the white pines are) was not. 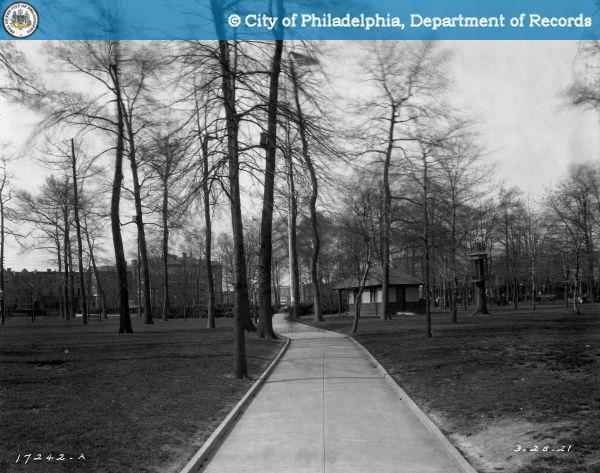 If we assume that these trees were part of park plantings, and not plantings of private property, then this gives a lower bound of 1910 for the year of planting for these trees (given that the property was not part of the park in 1910, as indicated by the maps linked to above), thereby further supporting the argument that these trees date to the vicinity of about a hundred years, again, much like the white pines of Cresheim Creek. And if we look again at that 1931 aerial, above, we see that the stand extends across the path that divides what was private property in 1910 from what was park property at that time. This further implies that the planting was associated with the park, and therefore would postdate the time when that lot became part of the park. More broadly, looking around Philadelphia today, along the Wissahickon or the Pennypack, or in the wooded areas of West Fairmount Park or Juniata Park, or throughout so many of the many other parkland areas currently in Philadelphia, we see forests, and it can seem some times as though that it how it has always been. By the late 19th century, the deforestation rate had slowed a bit, to about 2%, but that still means we’d expect stands to be at most about 50 years old at that time, in the late 19th and early 20th century, which is the time when we see the oldest portions of the lands that are now forested in Fairmount Park becoming the natural areas that we now know them as. That is to say that Fairmount Park was still quite young, by arboreal standards, as the 20th century arrived and moved forward – the oldest parts of it were on the order of a half century old at that time (dating to roughly the mid-19th century, that is), and many large parts were still coming to the city as the 20th century rolled on (for example, like the Pennypack, whose land starts being acquired by the city in 1905, and of course the site upon which the Hermit Lane pines now stand comes to the city around this time), and so the woods of Fairmount Park that we see now, filled with enormous tulip poplars and oaks and pines, and hemlocks, too, would have been pretty young at that time, and nowhere near as full as what we see today. I’m not aware of any stands in Philadelphia that are older than 100 to 150 years old, and this is pretty well in line with the historical data outlined above. This is not to say that there aren’t individual trees that are older than that, as we know that there certainly are ones much older than this (e.g, in Hunting Park), or even some groupings of older trees (e.g, if you go along the rocky hilltop trail along the Wissahickon, just north from the Henry Ave. Bridge, there’s some wonderfully old chestnut oaks growing among the rocks overlooking the Wissahickon there that, based on their size, quite clearly predate the late 19th century), but I’m not aware of any substantial stands of trees in Philadelphia that predate the late 19th century. And so we see in the first half of the 20th century a low of the areal extent of the forestation of Philadelphia – the woods had been cut over multiple times by then, and older stands that might have been found in less populated areas, perhaps distant out in the far northeast, or way out in the wilds of west Philadelphia, both dry and wet, were being cut down for the development that accommodated our growing population, and the current grandeur of Fairmount Park was still a young sylva at the time, not yet grown to the size that we see now. 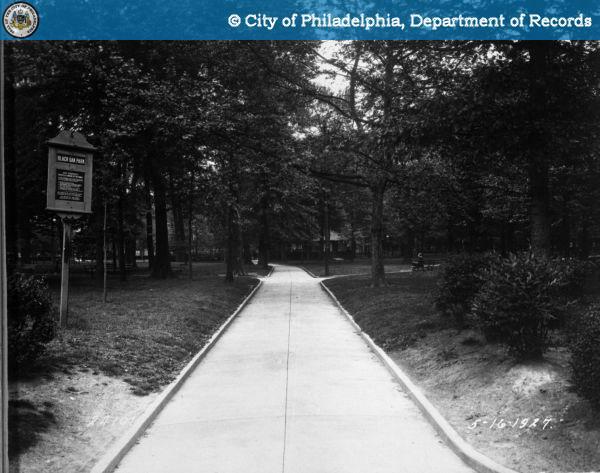 In the 1930s especially, it appears, Philadelphia had few forested areas – development had extended to parts of city that still had wooded spots, and Fairmount Park had not yet become the well forested agglomeration of sites that we know today. Though it can seem difficult today to believe that our green city was once so unwooded, an illustrative anecdote of this is provided in Richard Miller’s paper, “the Breeding Birds of Philadelphia”, in volume 51, number 7 of the Oologist (“for the student of birds, their nests, and eggs”), published in 1933, where he notes of the American Crow that it is “Common, but slowly decreasing, due chiefly to destruction of woods.” (I also note that the Red-Bellied Woodpecker, a bird of forests and woodlands, is not listed in Miller’s paper – this is a bird that I commonly see now, along the Wissahickon, and elsewhere (e.g, at Bartram’s Garden, on the 5th of April 2013), which calls to the increase of trees in Philadelphia, I note; this is a bird whose range has expanded northward generally in the past decades, I also note; NB: notes are good). Nowadays, so far as I am aware, no one fears for the crows due to lack of woods, and in this we can see the change from then to now – today there are wooded areas throughout the city, from Cobbs to the Poquessing, and so many places in between, where there are not just trees, but forests, and woodlands. Our landscape has changed drastically from a century ago – the woods we see now have grown since then, and what were once open areas are now wooded. Of course, the opposite has also occurred – what were once wooded areas now are not, and are now populated by buildings or streets or mown parks (sometimes this happened with quite a bit of opposition, as the fight over “Sherwood Forest” prior to it being cleared illustrates), and so it’s not like the woods have all grown up everywhere throughout Philadelphia, but as those wooded areas were being cleared, elsewhere parklands grew, and weren’t then cut again to clear the land, or for timber and fuel, and so we see this striking change throughout the landscape, from a hundred years ago to today. There also were differences in wetlands, between now and a hundred years ago, as is indicated by the inclusion of Typha angustifolia and “Phragmites Phragmites” (i.e., Phragmites communis), in Thomas C. Porter’s “Rare Plants of Southeastern Pennsylvania”, which is in the Botany Libraries at Harvard (it has a publication date of “March, 1900”). These wetland plants are quite common in Philadelphia now. An indicator of changes in wetland quality in the Wissahickon is that Chrysosplenium americanum, an indicator of pretty nice wetlands, was collected in the Wissahickon in the 19th century (by J. B Brinton on the 10th of June 1888 [with “fruit”, as indicated on the herbarium sheet], and by Albrecht Jahn on the 5th of May 1895 – both of these collections are at PH), but hasn’t been seen there recently. Coastal Plain sand-gravel; growing out of a covering of Cladonia. And so we see that this plant of open places was historically pretty common, though it does not appear to be quite as common as it once was, here in Philadelphia. And there are animals that also span the temporal divide – consider the Virginia opossum which, as is noted in Whitaker and Hamilton’s Mammals of the Eastern United States (3d edition; 1998), can live many places: “The opposum’s adaptability to a great variety of habitats, ranging from forest to purely agricultural lands, explains its success in the eastern United States. It is often quite common even in urban or suburban areas, and many are found dead on the highways.” and “The opossum is a solitary wanderer, remaining in no one place for long, and may be found far from trees. Its daytime den is in a fallen log, a hollow tree, a cleft in a cliff, a brushpile, a tree nest of a bird or squirrel, a woodchuck or sun burrow, or a recess under a building, or in many of other protected situations. Opossums do not dig their own dens, and thus are dependent on other animals, primarily the woodchuck and skunk, for ground burrows.” – they mostly den in wooded areas, arboreally as well as on the ground (and “in snags and leaf nests probably used or constructed in years past by squirrels”), though they have also been reported to den in an old field. This marsupial adaptability is reflected in the current presence of numerous opossums (opossa?) in Philadelphia today and their presence a century ago, as we see evidenced in the number of individuals presented to the Philadelphia Zoo for accession to its menagerie, in the early part of the 20th century, that came from Philadelphians – for example, from the “List of Additions to the Menagerie during the Year Ending February 28th, 1914”: “1 opossum presented by G.W. Cassel, Philadelphia.” (13 November) and “1 opossum ([male]) presented by Mrs. George Biddle, Philadelphia.” (9 December) and “1 common opossum ([male]) presented by Harry Rathbone, Philadelphia.” (13 January) and “1 common opossum ([male]) presented by Miss Theresa Hayes, Philadelphia.” (22 February); or for the year ending February 28th, 1914: “1 common opossum ([female]) presented by Walter Ellis, Philadelphia.” (13 March) and “1 common opossum ([female]) presented by Mrs. Harrold E. Gillingham, Philadelphia.” and “1 common opossum ([male]) … presented by Frank G. Speck Philadelphia.” (22 November) and “1 opossum ([female]) presented by Mrs. A. H. Gerhard, Philadelphia.” (1 December) and “1 opossum ([male]) presented by William F. Girhold, Jr., Philadelphia.”; and for year ending February 29th, 1912: “1 opossum presented by Master Ralph Fritts, Philadelphia.” (13 May) and “1 opossum presented by Guy King, Philadelphia.” (28 December) and “1 opossum presented by Mrs E. A. Cassavant, Philadelphia.” (4 February) and “1 opossum presented by The Walter Sanitarium, Walter’s Park, Philadelphia.” 18 February) and for year ending February 29th, 1920: “1 common opossum presented by Thomas Oakes, Overbrook, Pa.” (12 April) and “1 common opossum a presented by Dr. Frank Fisher, Philadelphia.” (3 October) and “1 common opossum ([female]) presented by John A. Caraher, Philadelphi” [sic] (30 November) and “1 common opossum (male) presented by John J. Daly, Philadelphia.” (23 February). All these and more can be read in the Annual Report of the Board of Directors of the Zoological Society of Philadelphia volumes 40-49; be sure to note also how many people from Philadelphia were donating alligators in those years. Note also the numerous birds and other animals that were either “caught in the garden” or “found in the garden” (including at least two screech owls). I’ll note here that peaches, mentioned in Father Mosley’s letter, though an introduction from the old world, have been here for quite some time – Peter Kalm mentions them multiple times in his Travels into North America; they are mentioned by Peter Collinson in letters he wrote to John Bartram; and William Penn mentions them in one of his letters home: “Here are also peaches, and very good, and in great quantities, not an Indian plantation without them; but whether naturally here at first I know not.“ (extract from “A Letter from William Penn, Proprietary and Governor of Pennsylvania in America, to the Committee of the Free Society of Traders of that Province, residing in London,”). And so, in the overall change of Philadelphia’s ecosystem over the centuries, many of the moving parts have remained, though they may have shifted gears a bit. This succession, the change in urban ecosystems through time, is not, as is illustrated by the Hermit Lane pines, strictly a passive process. It is, or at least can be, actively facilitated by people and their (or “our”, I should say, since we are all people) management – by planting those white pines, for erosion control or for reforestation, this altered the pattern of succession that we would have seen otherwise, from what we most likely would have seen, or at least what I’d expect to see, which would be a stand of tulip poplars, that would’ve now had trunks about a meter across and would now be just about reaching the end of their lifespan, to this massive stand of white pines that we see today. This occurred not by chance, but by human intervention, and is the reason that what we see today is there as it is. By looking at these old photos and maps, by reading old reports and census documents, by understanding landscape ecology and succession, we can see how what was done before has brought about what is here today – we can see the enormous changes that have affected our city, and often be quite surprised at just what those changes were and how they came about. It can be surprising to realize that Philadelphia has more dense forest today than it did a hundred years ago, and also then to learn the other impacts this brings about, on birds, as mentioned above, and also on water quality, among other environmental factors. And it is key to realize that this did not happen by chance; ecology in cities is due directly to actions by people, and always has been, for a very long time, as we see from those pines that were planted a century ago. We are part of these ecosystems, and thoughtful decisionmaking, such as that in the Philadelphia Parks and Recreation’s recently released Parkland Forest Management Framework, is needed for making these decisions in a way that will be amenable to all of us in and for Philadelphia, both now and in the years, decades, and centuries to come. 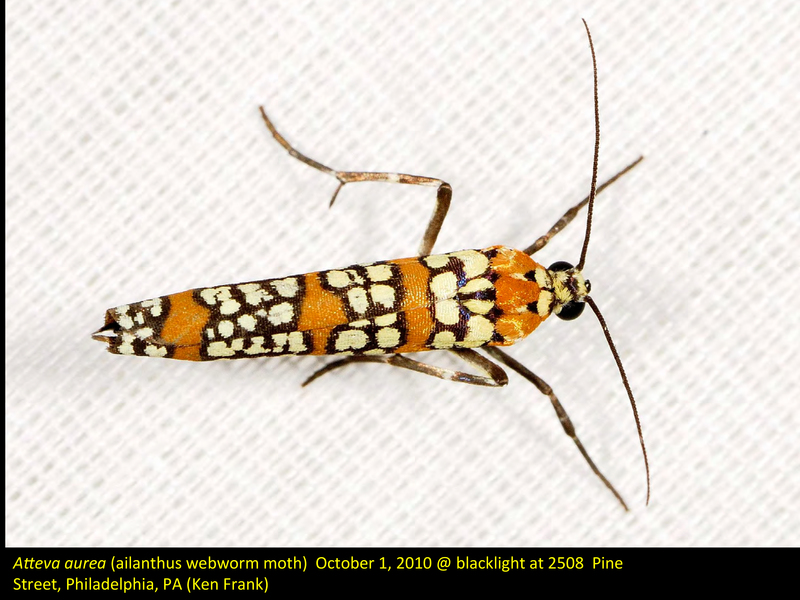 Posted on July 6, 2013 by David H.
“Unfortunately there are not many to be seen at the present time as the blasting for the new River Road destroyed most of the Ailanthus bushes upon which they chiefly fed. Only a short time before the rocks were removed I took over 200 specimens from a space less than 50 feet square. A number of these were captured upon the Ailanthus bushes in the act of eating the foul smelling leaves, a fact which seems to prove that no plant is too offensive to be used as food by some animal. Very many of these specimens were in perfect condition; as may be learned from the sample in the Philadelphia collection on the second floor of the Academy of Natural Sciences. The writer was the probable discoverer of this colony, which it is safe to say has never been equalled in this region either in number or in perfection of form and color. Another organism that eats Ailanthus altissima is the Ailanthus silkmoth, as is detailed in Ken Frank’s History of the ailanthus silk moth (Lepidoptera: Saturniidae) in Philadelphia: a case study in urban ecology, from volume 97 of the Entomological News (1986), available for perusal here. “The State-House [= Independence Hall] pavement was a wide and unpleasant place in warm weather when the sun was shining. Fully exposed, and reflecting back the heat, it was, in consequence of the buildings being far back from the line of the street, less attractive than sidewalks across which neighboring houses threw a shade in some periods of the day. No attempt was made to introduce any improvement until the fall of 1821, when trees were planted in front of the State-House, extending from Fifth to Sixth Street. Poulson [=publisher of the Daily Advertiser] said in reference to this improvement, “It will be a salubrious exchange for the arid bricks that have been broiling our brains there for fifty years.” The trees chosen were ailanthus, noted for quick growth and thick foliage. In ten or fifteen years the front of the State-House in summer time was as umbrageous as a forest. Afterward these trees were attacked by worms, and were ordered to be cut down. The axe was applied at some little distance above their roots, and in a few hours the grove, once the glory of the city, the favorite place in which the town politicians assembled to talk about nominating and elections to discuss political affairs -where they were commonly called “tree toads” – presented the dismal appearance of a forest in which the wood-choppers had been entirely too busy. The public could not stand that. In a short time new trees (silver maples) replaced the ailanthus, the idea being from experience that they would not be disturbed by the worms. They grew finely, and in a few years the grove in front of the State-House was restored to its original beauty. But just about that time the worms gave proof that they would change their diet upon necessity rather than starve. The ailanthus and paper mulberry having been almost exterminated as a sidewalk tree in the streets of the city, the worms accommodated themselves to circumstances, and condescended to devour the leaves of the maples. Note: Philadelphia was the site of what was most likely the largest introduction of house sparrows (Passer domesticus) into North America: one thousand of them, in 1869. The Invasive Ailanthus altissima in Pennsylvania: A Case Study Elucidating Species Introduction, Migration, Invasion, and Growth Patterns in the Northeastern US, by Matthew T. Kasson , Matthew D. Davis and Donald D. Davis; Northeastern Naturalist, 20(10):1-60. 2013. Adults of this species feed on Ailanthus in the autumn, and it is preferred by them for egg-laying as well.